The bitter gourd/karela juice is not only beneficial for our skin and body, but is also helpful in treating hair problems such as hair fall, dandruff, grey hair, damaged scalp and split hair. It will give you shiny, strong and long hair. Bitter gourd/karela is rich in proteins which is very vital strong and healthy hair. Bitter gourd/karela contains Vitamin C, Vitamin B1, B2, and B3, calcium, iron, riboflavin and beta-carotene. It also includes manganese, magnesium, foliate, phosphorus, thiamine and zinc. Bitter gourd/karela is an excellent vegetable for your all hair problems. The anti-microbial properties of bitter gourd help in preventing dandruff and scalp infections. It has also been found to be very beneficial in strengthening the hair and it prevents hair loss, hair breakage and split ends. Wash your hair with the bitter gourd juice to make it shiny, glowing and strong. Apply these hair masks to nourish your hair naturally and to get rid of hair loss, dandruff, damaged scalp, grey hair and split ends. 1. Take 2 cups of fresh bitter gourd/karela plant leaves and wash them with water. 2. Chop the leaves and grind them in grinder with adding half cup of water. Grind them completely. Strain the juice. 3. Take half cup of the juice and add 1 tablespoon of pure coconut oil in it. Mix them properly. 4. Apply this mixture on the damaged scalp, hair roots and ends; massage your scalp for 5-10 minutes with this juice. Leave it for 30-45 minutes and then rinse off with lukewarm water. 5. Apply this hair mask twice a week to prevent hair fall. 1. Extract half cup juice from bitter gourd and mix it with half cup of curd. 2. Apply this mixture on the hair and massage your scalp and hair roots for 5 minutes, then leave the mask for 45-60 minutes. Rinse it off with warm water. 3. Follow this remedy once or twice a week for prevention of hair fall. Dandruff is a common hair problem which also causes hair loss and is mostly arises due to the consumption of unhealthy food such as oily fast food and exposure to pollution. 1. Mix Half cup of fresh bitter gourd juice with 1 tablespoon of cumin seeds powder. Mix the ingredients properly. 2. Apply this mixture on the hair roots and scalp for 45 minutes, then wash it off with lukewarm water. 3. Repeat the remedy twice a week for a month to remove dandruff completely and to prevent it in future too. Damaged and dry scalp is one of the main reasons for hair loss and baldness. To repair your damaged scalp bitter gourd is very beneficial. 1. Mix half cup of bitter gourd/karela juice with 2 tablespoon of fresh lemon juice, mix them properly. 2. Gently massage your scalp and hair roots for 5-10 minutes with the mixture. Leave it for more 30-45 minutes and wash it off with lukewarm water. 3. Do this 2-3 times a week to repair your damaged scalp. You can see the result within 2 weeks. 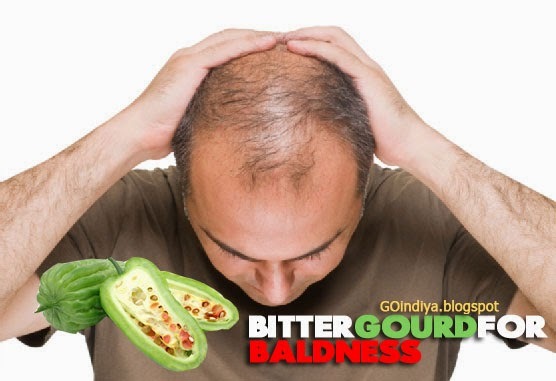 Bitter gourd/karela also cures and prevents premature greying of hair. Following method works magically in reduction and prevention of the premature graying of hair. 1. Squeeze half cup of fresh Bitter gourd/karela juice. Use fresh and green Bitter gourd to extract the juice. You can also add smooth paste of curry leaves, just take 15 fresh curry leaves, smash them to make fine paste and add it to the bitter gourd juice. 2. Apply this juice on the grey hair for 30-45 minutes and wash it off with lukewarm water. 3. Follow this remedy to once or twice a week to prevent growth of grey hair. You can see the result within 2-3 weeks. Bitter gourd is an excellent vegetable for restoration of the natural color of the hair and darkening of hair. You need not to apply any artificial chemical based hair dyes to color your hair, just follow this remedy to give them natural color. 1. Cut the bitter gourd in small pieces. Take coconut oil in the pan and place it on the low flame. 2. Roast the chopped bitter gourd pieces in this oil. When the bitter gourd becomes dark brown, remove the pan from flame. 3. Squeeze these bitter gourd pieces and extract the oil from it. When the oil is warm, apply it on your hair and massage your scalp for 5 minutes. Leave it for 30-45 minutes and then rinse it off with lukewarm water. 4. Repeat this once or twice a week for dark and smooth hair. Split hair ends are one of hair problem women suffering from. 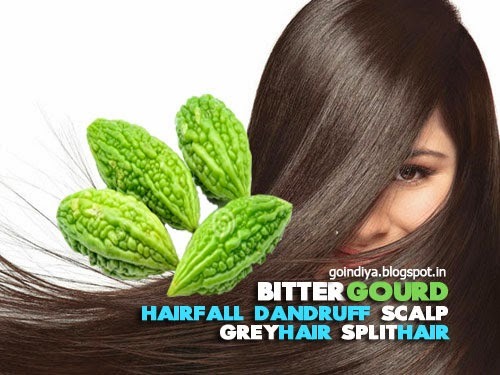 If you are experiencing the split ends problem, then apply the half cup of fresh bitter gourd juice over your split ends. Leave the application for 45 minutes and wash it off with lukewarm or normal water. Try this method twice a week to prevent the split ends. You can see the result in 3 weeks. Dry, rough, damaged scalp and scalp pimples is one of the main reason of hair fall and baldness, it also leads to premature graying of hair. Damaged scalp and scalp pimples are caused due to excessive sweating and poor hygienic conditions, diet. 1. Mix Half cup fresh bitter gourd juice with half cup of curd, then add 2 tablespoon of fresh lemon juice in it. Mix all the ingredients properly. 2. Apply this mixture on the hair roots and scalp, gently massage your scalp for 5-10 minutes with your fingertips. Apply this mixture on the hair and hair ends also. 3. Leave the mask for 30-45 minutes and rinse it off with lukewarm water. Do this twice a week to remove scalp pimples completely and to repair your damaged scalp. This hair mask also gives shiny to look to the hair. 1. Take this slice of bitter gourd and gently rub it on the damaged scalp in circular motion for 5-10 minutes. Then rinse your hair with lukewarm water. Do this 3 times week for fast result. Massage with the bitter gourd slices helps to repair the damaged scalp and you can get rid of dry, itchy scalp. 2. Take 1 ripe banana or avocado and grind it in the mixer or blender to make smooth paste of it. Then add half cup of fresh bitter gourd juice in this smooth paste of banana or avocado. Mix them properly and apply this paste of the scalp and hair roots, gently massage the scalp with your fingertips for 5-10 minutes. After 30 minutes, rinse it off with warm water. Repeat this 3 times a week to repair damaged and dry scalp.